Chris Coleman has backed his star attacker to deal with the latest criticism he is receiving in La Liga. Gareth Bale is not popular among some Real Madrid fans currently. 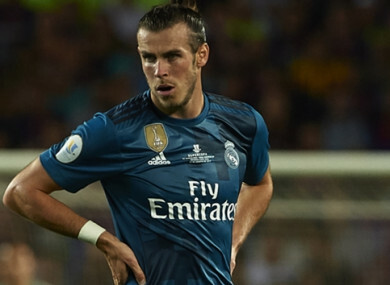 GARETH BALE WILL be unfazed by being booed once more by Real Madrid fans, according to Wales manager Chris Coleman. Bale came in for criticism during Madrid’s 2-2 draw at home to Valencia on Sunday, jeered by some supporters. The 28-year-old is preparing for Wales’ World Cup qualifiers against Austria and Moldova, and Coleman said Bale had learned how to deal with critics. This latest episode won’t faze him at all,” Coleman said on Tuesday. “People wondered how he would handle it when he went to Real Madrid [in 2013] because you are like a film star there, but he absolutely cruised through it. Coming off an injury-affected season, Bale has scored once in his opening four appearances in all competitions this campaign. Coleman said the star attacker understood his performances would always come under additional scrutiny. “There’s been a couple of periods where he has been under a lot of pressure, but all he needs to do is put his medals up. Yes, he’s had one or two injuries but he’s won three Champions Leagues,” he said. No-one else has ever gone to a foreign club from this country and done that. Absolutely nobody can doubt him. Email “Bale unfazed by latest Real Madrid boos, says Wales boss”. Feedback on “Bale unfazed by latest Real Madrid boos, says Wales boss”.